Mullowney’s has perfected the legal consumer experience by making legal services simpler and more affordable for clients to use and by making lawyers more accessible and responsive. By improving efficiency in our workload, we are able to focus more attention on each of our clients. Also, by utilizing the latest in communications technology, we are able to achieve unparalleled levels of client interaction. Mullowney’s represents clients in numerous areas of law. See our Practice Areas page for more information. J.L. Lee Mullowney (“Lee”) is an Ottawa lawyer and the principal at Mullowney’s, a unique, civil litigation boutique located atop the Fairmont Chateau Laurier Hotel in beautiful downtown Ottawa. Lee was born in Ottawa, received his formal legal education at the University of Ottawa, and has strong, deep ties to the city and its legal community. 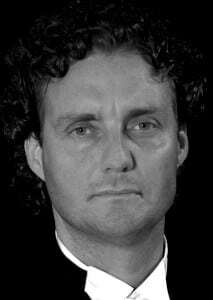 Lee works exclusively in the area of civil litigation and has been at the top of his practice for several years. He has successfully litigated cases at every level in Ontario. When Lee is not in the courtroom, he strives to educate fellow lawyers on the finer points of trial advocacy and practice management. He has provided his insight to a variety of Law Society of Upper Canada accredited programs on subjects such as defamation in the Internet age, managing client relationships, and maintaining a healthy work environment in a high performance law firm. Lee assists, through pro bono work, those individuals and groups unable to afford legal services and his law firm pledges to commit the equivalent of at least four percent of its annual billable hours to work on pro bono matters. 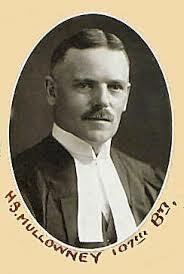 Interesting Fact 1: Captain Henry Strachan Mullowney (1877-1951, 147th Battalion) is one of the earliest members of the Mullowney family to practice law in Ontario. The photo (at left) belongs to the Law Society of Upper Canada Archives, Osgoode Hall Law School, Class of 1920. During the First World War, Captain Mullowney was, in fact, a clergyman. Upon returning to Canada, Captain Mullowney completed his law degree at Osgoode Hall Law School and began his career as a lawyer. Interesting Fact 2: The names Mullowney and Maloney (as in, Maloney Blvd., Gatineau, Québec) are derived from the native, Gaelic O’Maoldhomhnaigh Sept, taken from the Gaelic words meaning, “servant of the church”. Interesting Fact 3: During Ireland’s “Potato Famine”, the (orphaned) Irish children arriving in Canada were often adopted and raised by French Canadian families, who allowed the children to keep their Irish surnames. The Mullowney’s are forever indebted to the French for their kindness and this is why Canadian born Mullowney’s are often honoured with French first names.